We’ve been in the tea business since 2008 but did you know that back in the day eteaket’s Founder, Erica Moore, used to be a litigation lawyer. In what now appears to be something of a trend/exodus with female lawyers, she decided that life was too short to be doing something she wasn’t completely fulfilled by and passionate about. In a moment of clarity she decided that it was time to try and bring proper leaf tea back to the UK high street. The coffee culture was thriving and it was definitely time for tea. So she took some brave pills, handed in her resignation, loaded up her back-pack and went travelling to Sri Lanka and India to learn as much about the tea trade as possible. The learning process has been ongoing ever since. 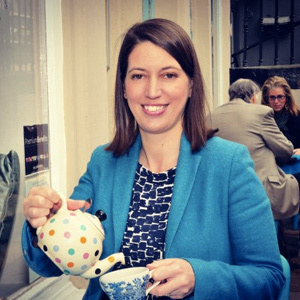 Erica opened eteaket’s Tea Room (41 Frederick St, Edinburgh) in December 2008 just as the financial crisis really hit. More brave pills, great staff and amazing customers meant we were able to grow a thriving wholesale business supplying cafe, restaurants and delis around the world with fabulous tea. We even export it overseas. 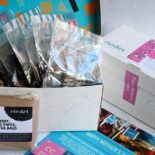 We also have a growing eCommerce business selling tea to lovely tea lovers all over the world. Most recently, we took the bold step of opening our first retail Concept Store (111 Rose St, Edinburgh). Everyone involved in eteaket is really passionate about what we do. 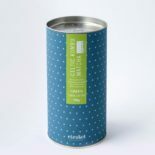 We aim to help stressed, health conscious people to reconnect with themselves and others by drinking proper leaf tea. It’s great to love going to work every day and very fulfilling, especially with our Cuppas for Causes campaign where we work with children in Scotland and India. We’re very clear that the tea industry needs to change. 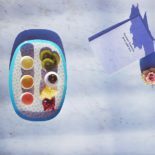 Thankfully tea drinkers are starting to appreciate the benefits of drinking proper quality leaf tea and are getting excited about different ways to drink it. Whether it’s cold brewed with a meal, enjoying a tea latte in your local cafe or enjoying a pot of your favourite brew with friends, tea is no longer old fashioned and boring. It’s trendy and exciting and the growing numbers of younger tea drinkers are testament to that. Heck we’ve even created Isle of Harris Gin Tea and Tomatin Whisky Tea… it’s definitely time for tea now. 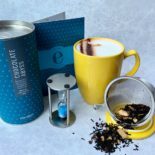 This entry was posted in Concept Store eteaket Ethics & Charity Work eteaket team General News, Awards & Press Tea Room and tagged cafe, career change, Concept Store, edinburgh, leaf tea, tea room, tea shop. Bookmark the permalink.